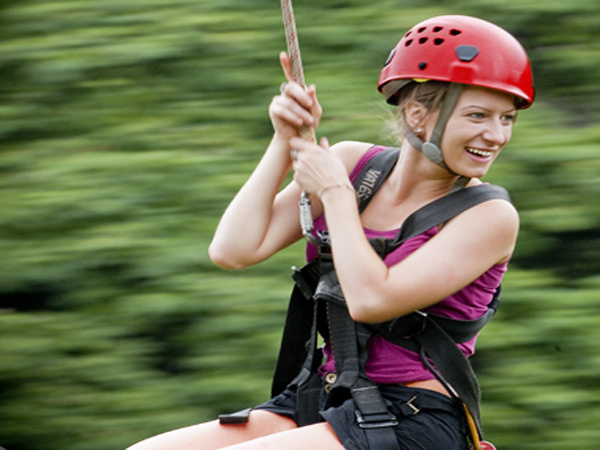 The Zipline Safari offered by Outfitters Kauai is an all day Kauai adventure at Kipu Ranch! Your day your day will include Kauai kayaking, wagon riding, Kauai zip lining (which is optional), trekking *Kauai Hiking), canoeing and a deli-style picnic. *Please note that the 7:15am (Poipu) and 8:00am (Kayak Shack) are the only tour times available on most days. You will be booked for one of these times if your preferred time is not available. Please call to check availability if you are unable to book for 7:15am or 8:00am. On this Kauai activity you get to Kayak along a Hawaiian jungle stream, travel across ranchlands on a wagon, zipline through the Kauai forest, and hike down to a waterfall where you can swim if you choose, and then cruise down the river to end this one of a kind Kauai Activity. Take a easy going downwind kayak trip on the Huleia River which is a beautiful historic jungle stream. Where the river begins to gets shallow, we will tie your kayaks to a tree and then take a short walk to a area of waterfalls and swimming holes. After that, you will enjoy a ride on a covered wagon for a trip across Kipu Ranch to the Kamapua'a Falls trailhead which is just a short walk to an picnic spot that is what you would image in Kauai. After lunch on the Zipline Safari with Outfitters Kauai, you will have the option of taking on an 800-foot Hawaii zipline over a waterfall and river, and then returning on foot on an 80-foot suspension bridge. You will then continue along the forest trail through exotic foliage to the Swimming hole for swimming, then cruise by wagon to Kauai’s jungle trail, where you'll hike about a mile down to the river landing where you will board a twin-hulled powered Hawaiian canoe for a cruise back down the river. The Kayaking: This is an easy going delightful downwind paddle which is about 2 miles. You'll use a two-person, open-cockpit type kayak, which is very stable and easy to get in. Kayak through the Hule'ia Natational Wildlife Refuge, which is a place for the preservation of endangered Hawaiian birds. You will pass the Alekoko Fishpond, which is an example of the ancient Hawaiian’s fishing and aquiculture methods that's still used today. In the background of this Hawaian tour is the Haupu Mountain Range, a dramatic and majestic 2000-foot shield volcano that towers over the river. Huliea has been the site of several movies, including Raiders of the Lost Ark, Jurassic Park, and its sequel Lost World. 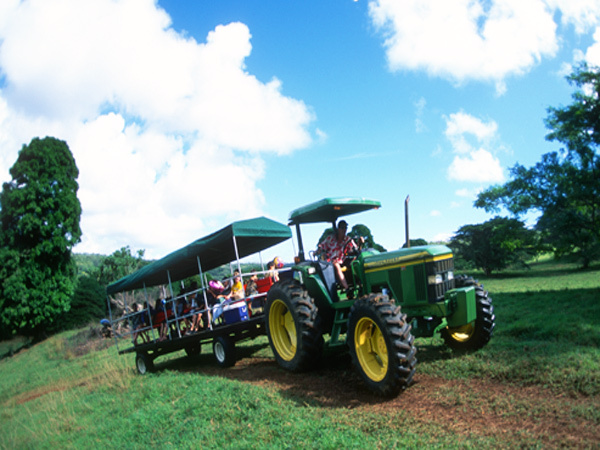 The Wagon Ride with Outfitters Kauai: Ride on benches in a custom covered farm wagon. It's a journey that will take you back in time on a narrated hayride across Kipu Ranch, a 4000-acre working cattle ranch! Bound for waterfalls, you'll be spotting wild boar, peacocks and pheasant as you journey through this Ranch. 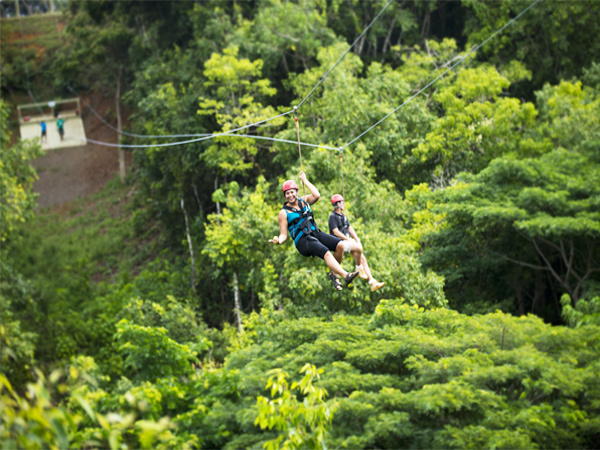 Kauai Zipping (Optional): Three thrilling 800-foot ziplines over waterfalls and rainforests. State-of-the-art equipment make for a 100% safe "extreme" experience. If you decide not zip line, you can jump on the wagon to the hiking trailheads. Hiking: On the Kipu Ranch Adventures tour, you'll hike on three different jungle trails, which takes you to hidden waterfalls and swimming holes. Each of the Kauai hiking tours are conducted as a nature walk, through tropical rain forests which consists of different plants, birds, and aquatic life. As you enjoy this Kauai activity, you'll be stopping for dives into beautiful pool-drop waterfalls cascading over black lava rock cliffs, swings on ropes tied to tree branches high over the mountain pools, while hiking through the fern forests of this Hawaiian Island. Canoe Ride: While on the downriver return trip, you can kick back and soak up the sun and scenery on Outfitters Kauai big, double-hulled Hawaiian Canoe. The canoe is 32' long and 10' wide, so there is plenty of comfortable seating. The canoe is powered by a small, quiet 4-stroke outboard motor. Enjoy the relaxing ride down the river, while enjoying the beautiful sights. A perfect ending to a perfect day! Minimum zipline age is 7. Maximum zipline weight is 275 pounds. Minimum zipline age is 7. Younger kids are welcome to take the tour, but will not be able to zip. Parents/Guardians are responsible for making sure younger kids can get along terrain or carrying them. Maximum zipline weight is 275 pounds. 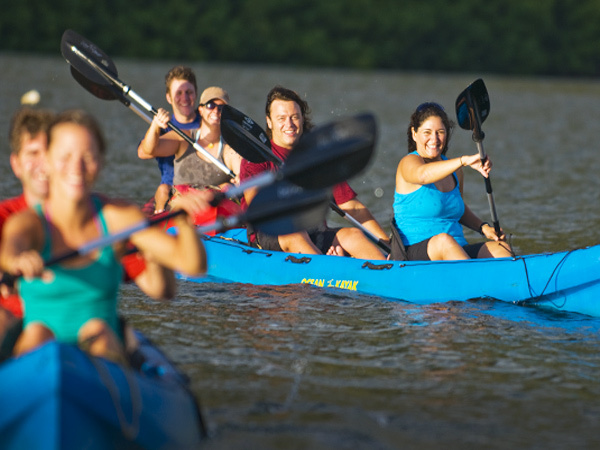 Participants must be able to walk 2 miles over uneven terrain and paddle in a tandem kayak for 60-90 minutes. All participants must read and sign a voluntary release and waiver of liability prior to taking the tour. Monday through Wednesday, Friday & Saturday tours are normally at the 7:15am/8:00am time. Thursday tours are usually at the 10:00am/10:45am time. Monday to Wednesday, Friday & Saturday: Tour usually runs at 7:15am/8:00am check-in times. Thursdays: Tour usually runs at 10:00am/10:45am check-in times.